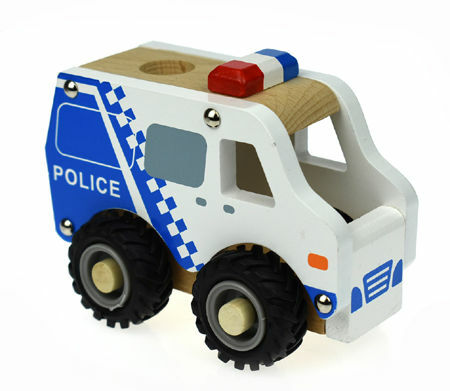 Wooden Police Car Rubber Wheels is a solid well made little truck. With a lovely smooth finish and a nice paint job it will soon be keeping the peace in your little ones toy town. A great push a long simple wooden toy with chunky rubber wheels that won't scratch your floor. This is a lovely toy which will inspire the imagination of any little law keeper. Size: 13 x 7.5 x 9cm wide ( perfect for small hands). We like this because: "A great size and beautifully made. Awesome rubber wheels "